A group of British activists walked for 174 days (about six month) from the UK to Jerusalem to apologize for “Balfour Declaration”, which granted Palestinian territories to Israel on its 100th anniversary. The activists launched a campaign to reject the Israeli occupation. The Palestinian government threatened to resort to international courts to prosecute Britain if it insisted on celebrating the occasion and not apologizing to the Palestinians. Chris, one of the activists, walked thousands of kilometers across 11 countries to Palestine, accompanied by a group of British comrades, declaring their opposition to the pact Foreign Minister Arthur James Balfour granted the Jews a hundred years. 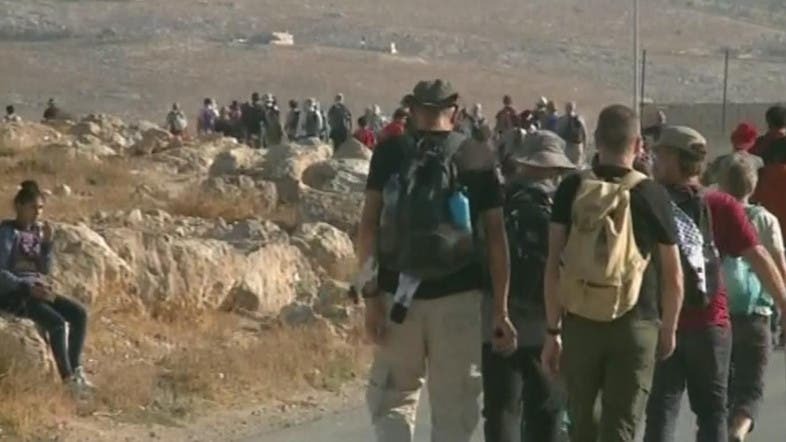 Over 100 activists walked with Palestinians through villages and viewed Israeli settlements expansions. Elias Dais, a member of the Secretariat of the Holy Land, explained how throughout the year they bring together similar groups to raise awareness the impact of the occupation. The villagers and their children welcomed the British group on their tour. The British government continues to commemorate “Balfour Declaration” despite 100 years of suffering continuing till today.